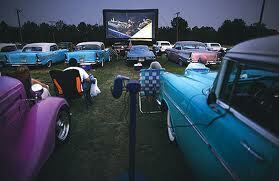 I read somewhere the other day (as one does) about the invention of the drive-in movie. Talk about stopping time or an “Alice through the looking glass” moment or some other literary allusion – my family used to be devoted drive-inners. Back in the day when I was under 8 we used to own a bottle green station wagon and a bright orange boxy Datsun of a vaguely dodgy lineage. They were both in their dowerage but still sprightly and the station wagon was the vehicle for drive-in. Our local venue came amply supplied with various fast food joints but my mum would always pack a hamper. If I close my eyes I can smell the coffee that was dispensed from a mustard coloured flask into crocodile green plastic mugs (we must have had a thing for green). Apparently I was too young for coffee so my beverage du jour was juice – something that you had to mix with water, can’t for the life of me get to the brand! On the menu were sandwiches – packed snugly in square Tupperware containers – cheese & tomato, egg mayo or chicken mayo. I think we had muffins for pudding (carrot maybe – so bizarre what you remember and what you don’t). The clearest memory is going from the bath to pj’s to the back seat armed with 2 pillows and a pink blanket. One of those really old-fashioned blankets with braid around it, king size so you could snuggle and make an igloo or a cave or a 5 storey mansion depending on your creativity. With a full tummy the anticipation took on lyrical proportions building to an epic climax when my folks would pull in the extendable speakers (one on the driver’s window and one on the passenger window), turn up the volume and the adverts would spew forth their drivel (not everything changes). Horror was always the most fun at the drive in – somehow the big screen lent a slightly ridiculous quality to an assortment of ghouls and severed limbs which glossed over their intended purpose. It was fun, it was “good” family time – we always went for the double bill but I don’t think I ever made it past the start of the second showing. My waking memory would be being carried from the car to bed by my dad and my mom “going to put the kettle on”. PS. DH and I drove past my old “local” drive in yesterday – it’s been closed due to lack of demand, old fashioned apparently doesn’t cut it any more. 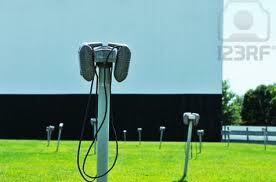 This entry was posted in Musings and Ponderings and tagged Bandsmoke Blog, Drive-in movies, Emotions, families, Feelings, In my head, Life, nostalgia, Parents, Relationships. Bookmark the permalink. I used to love going to the drive-in. Horror movies were great to watch – we all used to scream our heads off. It was such fun. I don’t think there are any left in Sydney any more. Such a shame….